These days the Cabo area is known as a hot tourist destination with luxurious hotels and activities to pamper yourself. But that’s only half of the adventure Cabo offers. Los Cabos, where desert and mountain terrain meets the Sea of Cortez and the Pacific Ocean, is the best place to learn how to do some of the most exhilarating activities in the world. Here are some of the most extreme activities on the Sea of Cortez to get you started on your Cabo adventure and get your adrenaline pumping! Half parasailing and half surfing, kiteboarding is quickly gaining force in the extreme sports world. 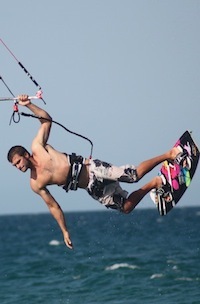 Kiteboarding uses the wind to pull you through the waves on a board similar to a small surfboard. Professional kiteboarders have reached speeds of over 50 knots – that’s fast! Exotikite is the only IKO certified and insured school on the East Cape. They offer lessons for all levels. For those who want to jump right in, the most popular package is the 8 hour course, “I Want it All”, over 2-4 days for $525. These lessons will teach you the basics of kiteflying and safety as well as give you lots of time in the water to try that first kiteboarding experience. Located in the Sea of Cortez, which Jacques Cousteau once called the Aquarium of the World., Cabo Pulmo is one of only three living reefs in North America. Known for schools of large fish and manta rays, this area is the of the best for Cabo Scuba Diving. Depths in the area can go up to 100ft. You may even get the rare chance to swim along side a whale shark. Manta Diving offers a PADI open water course for $450. This 4 day certification class includes four open dives as well as pool work and academic study. By completing the course you will get a PADI SCUBA diving certification that is valid all over the world. Hello Sea of Cortez! Experience the rare feeling of racing aboard an America’s Cup Yacht. These Teams New Zealand NZL81/NZL82 and Australia’ AUS29/AUS31 racing yachts are made only of the lightest highest-tech fiber and honeycomb core. They have a 34 meter (102 ft) mast and weigh 34 tons. You will get to hoist your sails and plan your strategies for the oldest sports competition. Visit Cabo Adventures at the Cabo Dolphins Facility in the Cabo San Lucas Marina. Professional staff will be there to help you, even if you have never sailed before. $100 ($70 for children) includes roundtrip transportation, professional gear and instruction, bottled water, soft drinks, beer and victory party! With breaks such as the world famous Zippers (a fast right break located in the Tourist Corridor) and El Tule (a nearby speedy wave that breaks both ways), it’s no surprise that Los Cabos has been the site for many surfing competitions. Surfing in Cabo can be a thrill of a lifetime. If you are looking to get started surfing in Cabo, the Mike Doyle Surfing School at the Cabo Surf Hotel is right by the best of the waves. 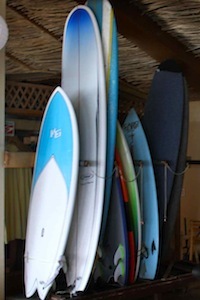 All lessons include board rental, rashguard use for the lesson, and beach and water instruction. Group lessons are $70.00 usd per person for 1.5 to 2 hours (time depends on the number of people in the group). Private one on one instruction is $95.00 per hour. Let us know which activity you chose (or if you were brave enough to try them all!). If you are already an adrenaline junkie – tell us about the most extreme adventure you experienced in Cabo!